Franko is an amazing new virtual currency based on cryptography. Franko coins can be instantly sent anywhere in the world over the internet via a shared public ledger for little to no cost. 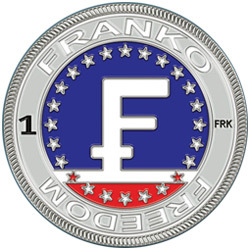 One Franko is denominated as 1 FRK. New FRK are released into the economy every 30 seconds by the network as payment for confirming transactions and securing the network. Franko is designed to produce 11,235,813 FRK over the next 500 years making FRK the most long term solution. Each FRK is divisible to the 8th decimal place which helps overcome the limitations of scarcity.